We are grateful to Sciblogs for the opportunity to comment on the blog-posting by Gareth Renowden which appeared on Sciblogs. Mr. Renowden was reacting to our newspaper article “Hypothetical global warming” in the Dominion Post. He later commented on the response by Drs. Wratt, Reisinger & Renwick (WRR) to our Dominion Post article. Our rebuttals of the Wratt et al. article are available here and here. A fully referenced version of our original article is here. It seems that Mr. Renowden and WRR are in agreement with us regarding many of the facts contained in our original article but neither appear to understand that the debate should be about testing the hypothesis that: Dangerous global warming is caused by human-related emissions of greenhouse gases. They simply assume that it is true. Due to limitation on space, we comment on a few of Mr Renowden’s comments. A full rebuttal is available here. In the text that follows, our original comments are in bold italics. Mr. Renowden asserts that palaeoclimatological evidence is the dominant reason for believing in future warming. The palaeoclimatological evidence shows that there is nothing unusually warm about present day temperatures and that past changes in temperature during climate cycling occurred BEFORE changes in carbon dioxide. That above diagram (climate4you) shows the five established global temperature records on a single chart. It establishes the lack of statistically significant atmospheric warming over the last 18 years. 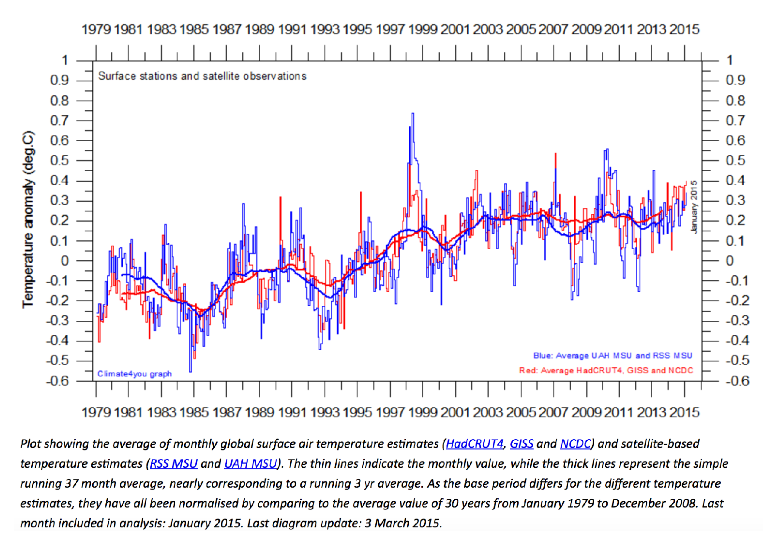 Models … “failed to predict this lack of warming”. Mr. Renowden comments: “Wrong. There has been no lack of warming”. 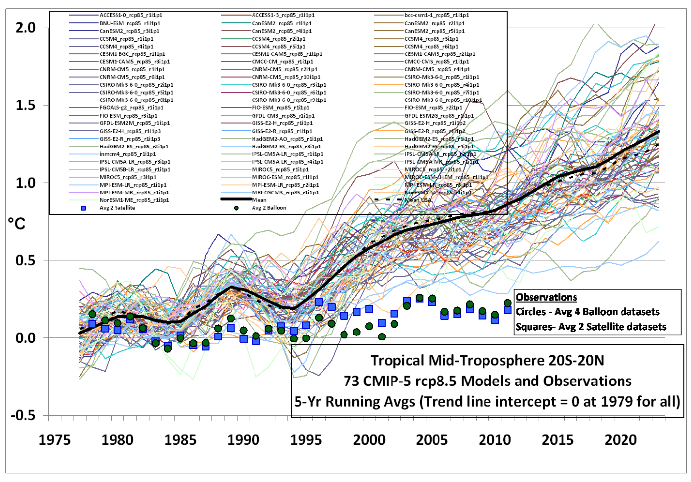 The graph above from Dr. Roy Spencer (who is responsible for the UAH satellite temperature record) shows 73 climate model projections compared with measured temperatures. The IPCC’s 5AR states that 111 out of 114 their climate model runs failed to reproduce the actual temperature record (IPCC AR5 Chapter 9, Box 9.3.2). Our statement was accurate. In contradiction, Mr. Renowden asserts that “the vast majority – 97% or thereabouts…would beg to differ with our statement”. This is irrelevant. Science is not concerned with consensus. It is about evidence and hypothesis testing. 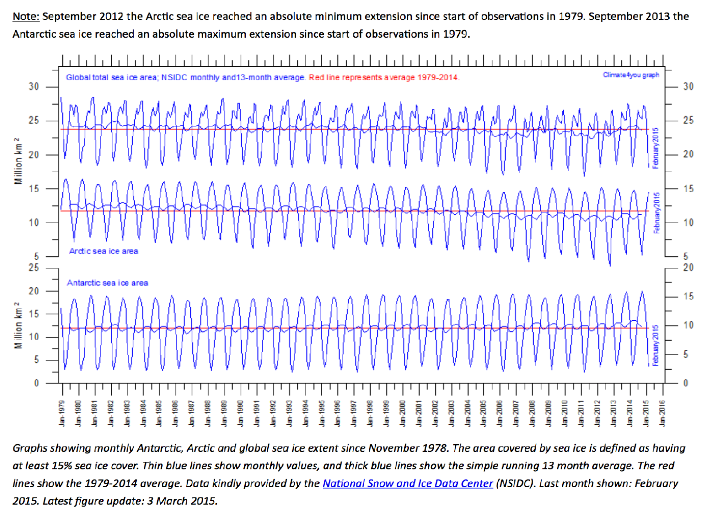 Mr. Renowden asserts that the sea ice area is decreasing rapidly. 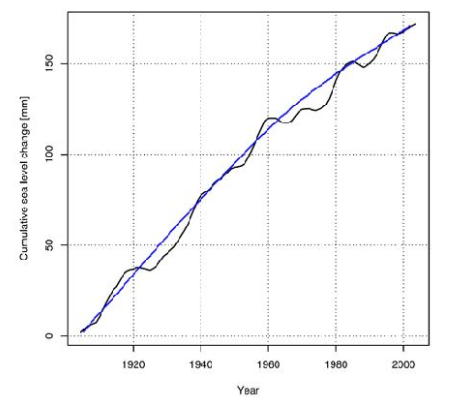 The graph from climate4you shows that the total sea ice area has hardly changed since 1979. Mr. Renowden asserts that “the rate of sea level rise has accelerated in recent decades”. A chart of the rate of sea-level rise during the 20th century (Holgate, 2007) shows that the rate of rise of global sea level has decreased. Mr. Renowden claims that polar bears are “still listed as endangered …”. “The US Fish and Wildlife Service estimates that the polar bear population is currently at 20,000 to 25,000 bears, up from as low as 5000 to 10,000 bears in the 1950s and 1960s,” and the United States Geological Survey states that “polar bear populations may now be close to historic highs”. After agreeing with the statement, Mr. Renowden comments that living conditions for human inhabitants of coral islands “are becoming difficult, and will become impossible later in this century”. Maybe. But the problems are largely caused by a growing population and environmental degradation. Mr Renowden is entitled to his opinion on the future: he provides no supporting evidence. Mr. Renowden disagrees even though the IPCC says”…there continues to be a lack of evidence… regarding the sign of the trend in the magnitude and frequency of floods…” (IPCC, 2013). Although the statement is factually correct, Mr. Renowden dismisses the scientists as “cranks”. This is not a useful contribution to the debate. Mr Renowden asserts that “the real climate debate is not a scientific debate, or a debate about the science, it’s about how we deal with an issue which is going to shape the lives of everyone over the next few hundred years”. So he wants people to accept massive changes in lifestyle and income to deal with something that may or may not happen. This is social engineering, not science. We stand by our original opinion piece, and leave it to those who have read the material above and the full version here to judge Mr. Renowden’s credibility.